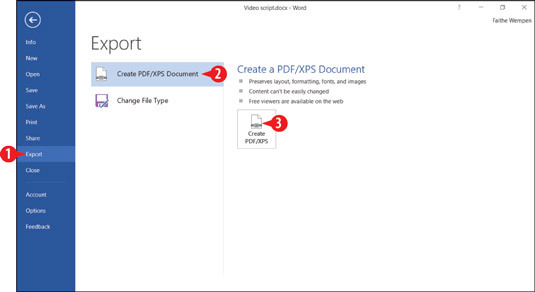 You can save your Word document in PDF or XPS format. These are both page layout formats, and files in this format are designed to show pages exactly as they will print. They are not designed to be easily editable. You might save a contract in this format, for example, or a ready-to-print brochure. PDF stands for Page Description Format. It is a very popular format by Adobe. Anyone with the free application Adobe Reader can read PDF files. XPS is the Microsoft equivalent; is has similar features and properties, and can be opened in using the XPS Reader application that comes with Windows Vista and later. Click Create PDF/XPS. The Publish as PDF or XPS dialog box opens. Save a document as a PDF or XPS file. Change the file name in the File name box, if desired. Open the Save as Type drop-down list and choose PDF or XPS Document as desired. In the Optimize For section, click Standard or Minimum Size. In step 5, use Standard in most cases. Minimum Size decreases the resolution of the file as it decreases its size. The smaller size may be useful when sending a document via email, provided the document’s quality (resolution) is not important. After step 6 you can click the Options button for a dialog box containing even more options for the resulting PDF or XPS file. Mark or clear the Open file after publishing check box as desired. If marked, this option opens the PDF or XPS file in an appropriate reader application, outside of Word, after you save. 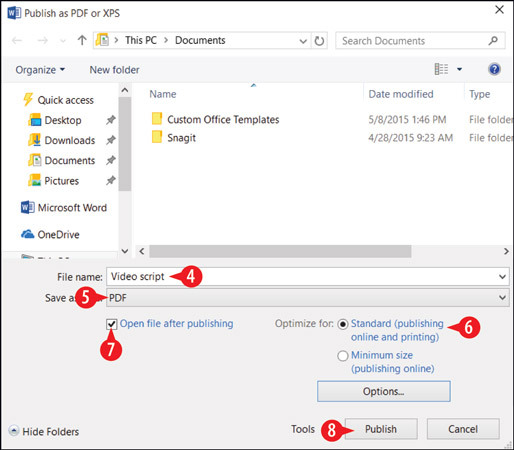 Specify saving options for your PDF or XPS file.